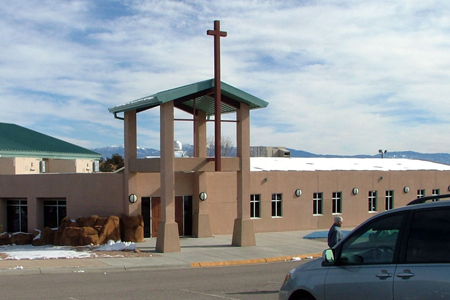 A plain-looking modern structure accessed via a covered porch topped by a wooden cross. Inside, one enters a large foyer featuring a multi-level baptismal pool and an information kiosk. To the right is a corridor of classrooms. The auditorium is oblong and decorated in beige and cocoa brown. There is a stage with projection screens on either side and a quilt in the center decorated with three crosses. Musical instruments dominated the stage, as if a concert were about to take place. White Rock Baptist appears to be an arch-conservative evangelical congregation. They place strong emphasis on the Bible and believe that all Christians should achieve what they call "theological competency" (the ability to speak comfortably about basic Christian beliefs). Their various spiritual and social ministries are documented on their website. Los Alamos is a small town situated on the Pajarito plateau in northern New Mexico, said to be one of the most beautiful landscapes in the American Southwest. During World War II, a team of scientists working at Los Alamos conducted an operation known as the Manhattan Project, which produced the two atomic bombs that were dropped on Hiroshima and Nagasaki. Today, the Los Alamos National Laboratory, northern New Mexico's largest employer, continues to conduct research in nuclear weaponry as well as other areas. The church is situated in a rural setting outside the town, with spectacular views of the surrounding mountains. The Revd Chuck McCullough, pastor. I counted about 350 chairs and they were all occupied. All age groups were evenly represented. A gentleman said good morning, shook my hand, and gave me a service leaflet. There were wooden chairs with upholstered cushions - comfortable enough. People visited quite a bit as they enthusiastically greeted one another. "Well, good morning. It's 9.00 so we're going to get started." A service leaflet and the Hymnal for Worship and Celebration. Piano, guitars and drums, plus five vocalists. One of the vocalists drank from a bottle of water in full view of the congregation. I would have preferred to see her duck behind a pillar or at least turn her back. The gentleman who read the scriptural passage mumbled it into his Bible instead of projecting it out into the congregation. A very enthusiastic and spirited hymn sandwich. After the opening words, we were asked to stand and greet each other. This was followed by a lengthy improvised prayer plus some selections by the praise band, including the dreaded "Shine Jesus Shine." Then a passage from scripture was read, followed by more prayers, more singing, and finally the sermon and a benediction. There was a palpable sense of energy, but even so I would call the congregational singing rather timid. 15 minutes for the children's sermon, including a summary for the benefit of the adults, followed by 39 minutes for the adult sermon. 8 – Pastor Chuck spoke to the children at their level, and they seemed to be enjoying his talk, although to me it sounded a little too much like those Saturday morning children's TV programs of yesteryear - remember Romper Room and Ding Dong School? But he adopted a casual, intimate style for the adult sermon that was very effective. (Children's sermon) While taking down his Christmas decorations, Pastor Chuck found a cocoon. The cocoon will bring forth life by a process of change. Everybody changes over time. It is God who changes us. We don't understand how life comes about, but if we listen to God he'll tell us. Let God show us who he is. (Adult sermon) The adult sermon was based on Mark 9:1-13, the Transfiguration. Jesus was full of surprises. When Jesus took Peter, James and John up the mountain, he knew he was preparing them for leadership but that they were still very much in training. The radiance of his transfiguration brings to mind other manifestations of radiance, e.g. the angel in the garden of Eden, Moses on the mount, the pillar of fire leading Israel out of Egypt. A further radiance was yet to come, namely the descent of the Holy Spirit at Pentecost. We can see God's plan in all of this, but Peter, James and John reacted as we tend to do when confronted with God's glory: "Let's build something!" God's voice from the cloud made it clear that Jesus was the Messiah, but Jesus warned his disciples not to tell anyone what they had seen that day (because they didn't yet understand) until after his resurrection (when they would understand). The transfiguration is a preview of what God will do to us if we will let him. We must ignore the world that bombards us with material things and teaches us that more is good, and we must listen to God instead. Our walk up the mountain with God will be far from boring. Even though I thought the children's sermon was a bit over-simple, I liked the way Pastor Chuck reacted to the children's remarks. Every time he asked them a question, he was able to work even their most wildly imaginative answers into what he was saying. They couldn't throw him. For example, one little boy said that an angel was in the cocoon. "I don't think so," Pastor Chuck replied, "but you never know. Angels can show up anywhere." And putting his hand on the little boy's head, he asked, "Is he an angel?" Well ... "Shine Jesus Shine" and the other modern Christian songs. They just aren't for me, although I will say they were performed with dignity and grace. And we did sing "Be thou my vision," which almost made up for it all. There was an intermission between the service and a break-out into a dozen or so Bible study classes. A few people smiled and said hello as I stood there with hat and coat in hand looking sheepish, but no one stopped to talk. A mob had formed around a table on which there were several kinds of cookies as well as thermos jugs full of regular, decaf and "bold" coffee. Unfortunately the bold thermos was empty, so I settled for the regular, which was adequate. The cookies were tasty. 7 – I prefer a more liturgical style of worship that includes holy communion, but I enjoyed the sermon and would return again to hear Pastor Chuck preach. Yes. Everyone seemed glad to be worshipping and I felt spiritually moved even though it really isn't my style.